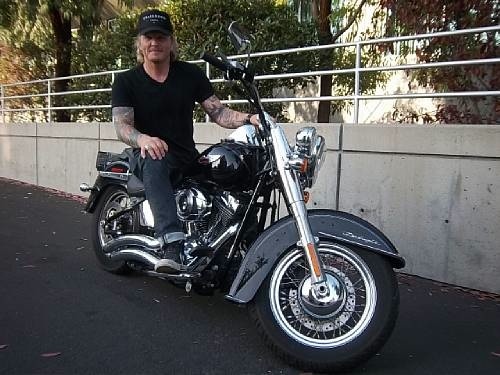 Matt Sorum with his customized 2008 Harley-Davidson Heritage Softail. Sorum’s bike will go on auction Nov. 12 at the Petersen Automotive Museum in Los Angeles. Famous auction house Bonhams recently announced the addition of customized Harleys belonging to Matt Sorum, most recognized as the drummer for Gun N’ Roses, and from the lead singer of Godsmack, Sully Erna, as new lots in the upcoming Classic California Sale on November 12 at Petersen Automotive Museum in Los Angeles, Calif.
From Sorum — who also played with The Cult and was a founding member of superband Velvet Revolver — is a 2008 Heritage Softail 2 Custom with a tuned engine, aftermarket exhaust pipes, slightly lowered suspension and just 2,000 miles on the odometer. Erna’s bike is a 1998 Heritage Softail Custom with aftermarket rims and pipes, ape hangar bars and silver-on-black flame job. 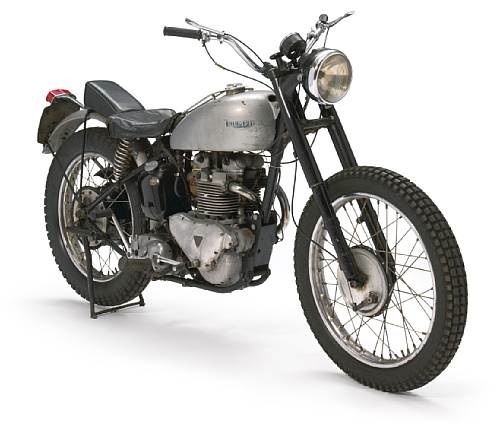 According to Bonhams both motorcycles will join a line-up of vehicles either owned by celebrities or featured in major Hollywood movies, in addition to many other customs and classics from all eras of the American road. In addition to Sorum’s and Erna’s Harleys, k.d. 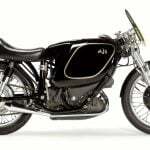 lang’s 1966 Triumph TR6 Custom is up for auction, as well as the 1949 Triumph Trophy 500 ridden by the Fonz in the hit television series Happy Days. 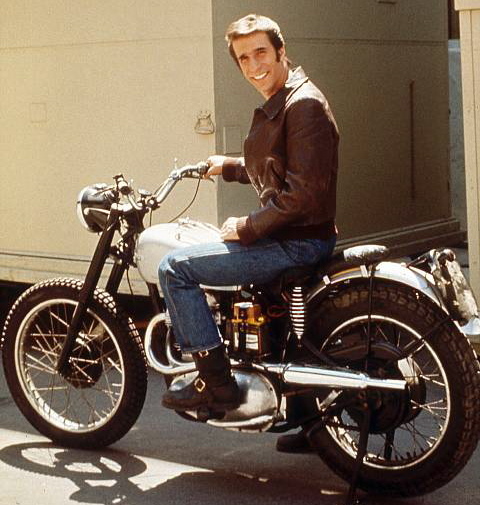 Bonhams estimates the Fonz’s bike may bring $60,000 to 80,000. TV characters don’t get much cooler than Arthur Herbert Fonzarelli, better known as “The Fonz” on the long-running ABC sitcom “Happy Days” that aired Tuesday nights from 1974-84. At its ratings high point the show was watched by some 40 million Americans, who tuned in to see the adventures of 1950s Milwaukee high-schooler Richie Cunningham (Ron Howard), his family and friends. Originally a bit player, Fonzie as portrayed by Henry Winkler become the show’s big breakout star. So iconic was the loveable biker and ladies man that TV Guide named him as number 4 on its “50 Greatest TV Characters of All Time” rankings. When the show was finally cancelled, his trademark brown leather bomber jacket was acquired by the Smithsonian Institution. But what of The Fonz’s other prop, his Triumph motorcycle? As often happens with vehicles used in television and movies, once production shut down it seems to have wandered off, lost to the mists of time. So it was with the “Happy Days” Triumph, until Cycle World writer Wendy F. Black was assigned to track it down for a story in 2000. 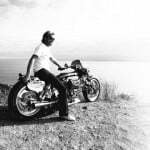 Her quest started with the kingpin of all things having to do with Hollywood and motorcycles: Bud Ekins, racer, stuntman, provider of car and bikes to the studios. 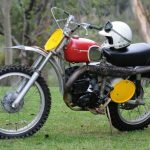 According to Ekins, there were actually three Triumphs, all 500cc Trophy models of various years, used on the show, two of which had indeed gone missing – stolen, raced into the ground or sold off for parts. 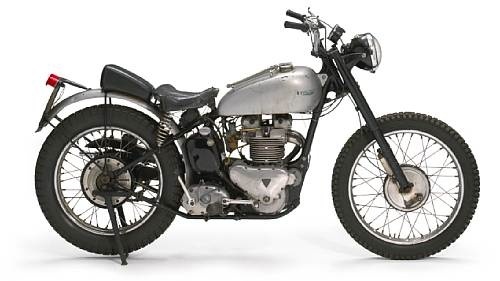 But Ekins not only knew about the third and remaining Triumph, he had originally supplied it to Paramount Studios after yanking off the front fender, bolting on a set of buckhorn handlebars and painting the gas tank silver. The Fonz, after all, would not ride a stock motorcycle. Ekins also pointed the magazine writer north to Oakland where the sole remaining Fonzie bike had been since 1990, hiding in plain sight, stored unceremoniously at Mean Marshall’s Motorcycles. 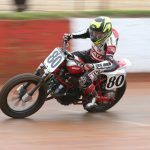 Shop owner Marshall Ehlers purchased the bike from Ekins not for its star power but for the model’s race history, its all-alloy engine and its sparse good looks. At one point he even considered restoring the Trophy back to showroom-stock spec. 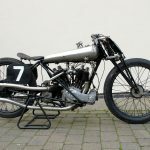 Happily that didn’t happen and now one of the world’s coolest Triumphs, untouched since it last rolled across television screens 27 years ago, is ready for its second act. A portion of proceeds from the sale will be donated by Bonhams to aid Henry Winkler’s charitable work in support of children with dyslexia.